It always seemed that it could never happen here, but when a cat infected with rabies is smuggled into Britain it triggers a major crisis. Facing hostility from the public (angry that some of their pets have been impounded) the authorities struggle to stop the outbreak from spinning out of control …. Tom Siegler’s (Ed Bishop) decision to befriend an apparently benign wolf he discovers at the side of the road has far-reaching consequences. By now the audience has already been primed to expect something awful to happen, although the tension is eked out for a few minutes longer (Tom, having cut his finger slicing a lemon, then goes over and pets the fox – although at this point there’s no reaction). The boiling point isn’t far away though. Animal wrangling must have been an issue for the serial, as attempting to depict rabid beasts would require considerable co-operation from the animal actors (which no doubt couldn’t always be guaranteed). Director Robert Young keeps the tension bubbling along though, thanks to rapid cuts and close-ups, with the result that the action scenes feel viscerally real. Young had cut his teeth on horror films (directing Vampire Circus for Hammer in 1971) before moving into television in the early eighties. Robin of Sherwood, Bergerac, Jeeves & Wooster and G.B.H. all benefitted from his presence. Possibly it was his work on The Mad Death which made him an ideal fit later for Robin of Sherwood, as both had – at times – a woozy, non-naturalistic feel. This is first seen in The Mad Death after Tom, by now seriously ill after being bitten by the fox, is hospitalised following a car crash. The hospital should be a place of safety and security, but instead it’s a hallucinogenic nightmare for him. The mere act of reaching for a glass of water becomes overwhelming (he’s then pictured drowning in a bed of water – a technically impressive shot) whilst other visions are equally as disconcerting (his wife and his mistress both pay him uncomfortable visits). It’s interesting that during these scenes we often switch in and out of reality (with the result that the viewer is privy to Tom’s fevered imaginings). This simply adds to the sense of horror. Bishop, a sometimes underrated actor, is excellent as the increasingly tortured Tom. Another stand-out scene for him occurs earlier in the opening episode when he attempts to dispose of the fox. First with a broom handle (that was never going to work) and later with his car. Eventually he does manage to drive him off, but by then the damage has been done. 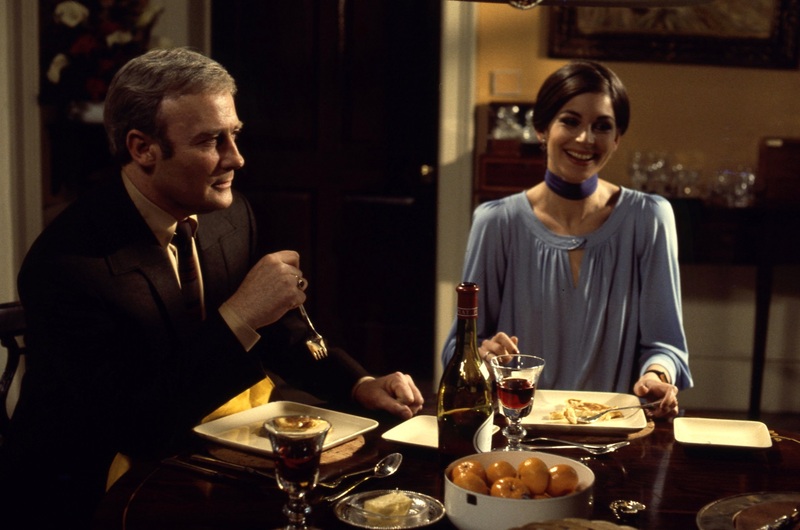 Although Tom’s story dominates the first episode, the two central characters of the serial – Michael Hilliard (Richard Heffer) and Dr Anne Maitland (Barbara Kellerman) – are also introduced. They first appear during the opening few minutes in a rather clumsy way. It might have been better to cut this scene and hold them back until they actually started to interact with the main plot (for example, when Anne was dispatched to the hospital to confirm the diagnosis that Tom is suffering from rabies). If Anne has the medical knowledge, then Michael is her equal when it comes to the veterinary angle. But he’s refusing to get involved …. Richard Heffer was by this time a very familiar television face. A regular in several 1970’s WW2 dramas (Colditz, Enemy at the Door) he’d also made several appearances in Survivors and had appeared throughout the final series of Dixon of Dock Green. Barbara Kellerman had also notched up some notable television appearances during the seventies (The Glittering Prizes, 1990, Quatermass) and would later go on to appear in the BBC’s C.S. Lewis adaptations during the late eighties and early nineties. The beginning of the second episode brings any latecomers up to speed with a summation of the events so far, before looking ahead to the current measures being implemented to control the outbreak. This is done quite neatly via a news report (a very effective way of info-dumping). Episode two also sees a rabid dog terrorising a group of customers in a shopping centre. With a fair number of extras deployed, it’s a good indication that The Mad Death had a very decent budget. Robert Young once again crafts some striking shots – a slow plan past several shop window dummies (stopping eventually on what initially appears to be another dummy but turns put to be a heavily suited dog handler) is especially memorable. A series of jerky cuts gives these scenes a naturalistic, documentary feel. Anne continues to prove that she’s no shrinking violet by driving a jeep containing Michael and a number of marksmen at high speed through the shopping centre (in a desperate attempt to get to the dog). This is something of a wish-fulfilment scene, since most of us have probably wanted to do this at some point. Inbetween the moments of terror are longer periods of reflection. Animal lovers, such as Miss Stonecroft (Brenda Bruce), are appalled at the way their pets are being treated (chained up like prisoners twenty four hours a day, she says) whilst Michael and Anne eventually fall into each other’s arms. This always looked inevitable, but it seems sure to annoy Anne’s partner Johnny (Richard Morant). And the fact he’s an arrogant member of the landed gentry who isn’t prepared to take any precautions with his animals is guaranteed to get Michael’s back up …. The third and final episode ramps up the action another few notches after Miss Stonecroft lets a whole pound full of dogs loose. With the animals roaming the countryside, Michael takes to the skies, coordinating a team of armed soldiers. Their instructions are clear – all animals are to be shot on sight. The filmic sweep of these scenes is another example of the serial’s healthy budget. Meanwhile, Anne finds herself tangling with an increasingly detached Miss Stonecroft whilst Johnny, also doing his bit to deal with the dogs, eventually runs into Michael. The question is, will he use his gun on the animals or on his love rival? These interlocking plot threads help to keep the interest ticking along until the final few minutes. Shot on 16mm film, the picture quality is generally pretty good considering the age and unrestored nature of the material. I did notice one picture glitch – at 18:38 during episode three there’s a slight picture breakdown (a brief loss of sound and a blank screen for a second or two). After the blank screen, we see Michael raising a glass of scotch to his lips but before the glitch he wasn’t holding one, so a short section of this scene is missing (Michael being offered and then accepting a drink). Luckily it’s not a vital moment, but If I learn any more about this issue then I’ll update this review. Thirty five years down the line, The Mad Death is still a tense and disturbing watch, thanks to Robert Young’s skilled direction and the performances of the cast. It remains a powerful serial and is well worth adding to your collection. The Mad Death is released by Simply Media on the 7th of May, RRP £14.99, and can be ordered directly from Simply here. Quoting ARCHIVE10 will add a 10% discount to the order. 1990, which ran for two seasons during 1977 and 1978, was set in a Britain tyrannised by the Public Control Department (PCD), a Home Office organisation dedicated to crushing free speech and any other signs of dissent. Given the parlous state of Britain during the 1970’s, it wasn’t surprising to find a series which posited what might happen if the economy finally and irrevocably disintegrated. And given the way things are today, many of 1990‘s themes seem eerily topical …. Some background to the collapse is teased out as the series progresses. We learn that the country went bankrupt in 1983, which led to a series of swingeing restrictions from the newly-formed PCD. These included strict rationing – not only of food, but also of housing and other essential services. Virtually everything has been nationalised, meaning that the government has almost complete control. Dissidents are harshly dealt with – via Adult Rehabilitation Centres – where they are treated with electro-convulsive therapy. 1990 is a grim place then, but there are still a few people attempting to resist the state. 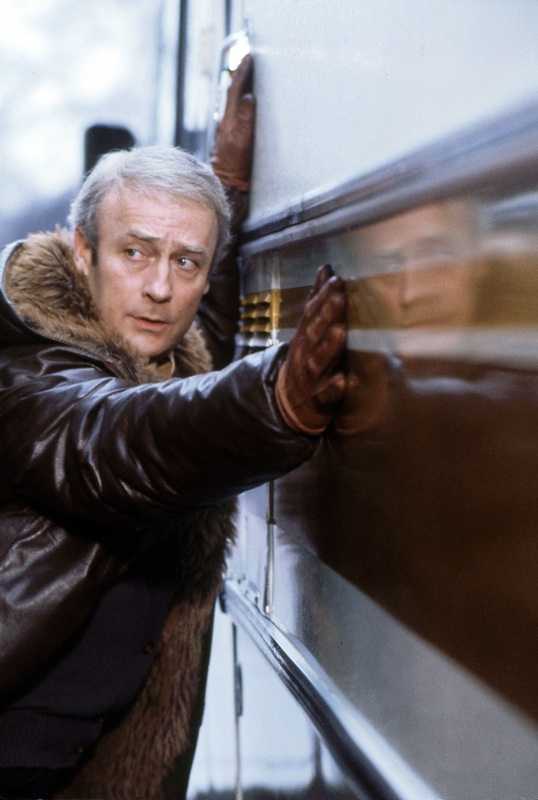 One is Jim Kyle (Edward Woodward), a journalist on The Star, one of the last independent newspapers. 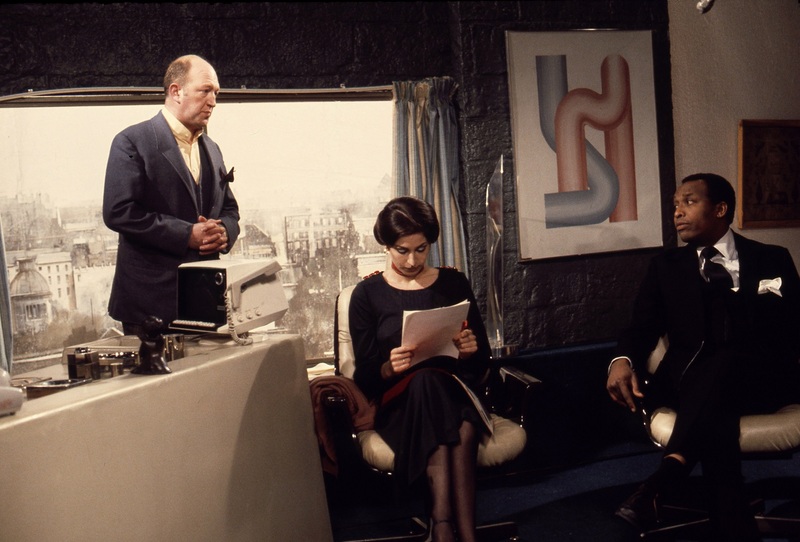 The PCD, in the form of Controller Herbert Skardon (Robert Lang) and his two deputies, Delly Lomas (Barbara Kellerman) and Henry Tasker (Clifton Jones), keep him under close surveillance, which leads to a tense battle of nerves. Series creator Wilfred Greatorex (1922–2002) started his career writing for Probation Officer (1962) and quickly moved onto The Plane Makers (1963 – 1965) and its sequel The Power Game (1966 – 1969) where he acted as the script-editor. Character conflict was key to both The Plane Makers and The Power Game and it’s plain to see that a similar format was carried over to 1990. The heart of the series is concerned with the way the main characters (especially Kyle, Skardon and Lomas) interact. 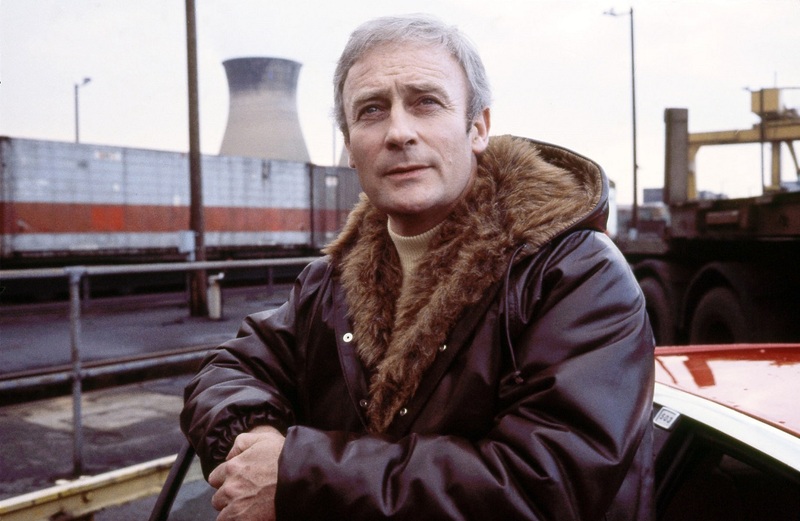 Edward Woodward (1930 – 2009) had been acting since the mid 1950’s but it was Callan (1967 – 1972) which really established him as a household name. His success as the world-weary state-sponsored killer allowed him to diversify (pursing his love of singing in The Edward Woodward Hour, for example) whilst cult films like The Wicker Man (1973) enhanced his profile even more. Woodward was a quality actor and his central performance is one of the reasons why 1990 works as well as it does. The series opened with Greatorex’s Creed of Slaves (“Necessity is the plea for every infringement of human freedom. It is the argument of tyrants; it is the creed of slaves” – William Pitt the Younger). Kyle is penning a piece for his newspaper on the Adult Rehabilitation Centres (ARCs) which causes Skardon considerable irritation. But that’s merely the tip of the iceberg as Kyle is also part of an organisation dedicated to smuggling people out of the country …. The next episode, When Did You Last See Your Father?, continues one of the plotlines from episode one, concerning Dr Vickers (Donald Gee), a man who is keen to take his wife and family out of the UK. This proves to be impossible via official means, as exit visas are severely restricted. The banality of evil runs throughout the series. On the one hand, Skardon, Lomas and Tasker are simply bureaucrats doing a job (in their minds they no doubt see themselves on the side of law and order). It’s this blurring between “good” and “evil” which is so compelling – the PCD may be oppressive, but their public face can appear to be reasonable. This is key – if you can keep the nastiness buried then maybe you stand a chance of fooling most of the people. The first non-Greateorex script, Health Farm, stars the imposing Welsh actor Ray Smith as union leader Charles Wainwright. Following a disastrous trip to America in which he gave a speech littered with criticisms of the British government, Wainwright is sent to an ARC for “correction”. The shocking change in him (from the firebrand we first meet to an adjusted patient keen to toe the party line) brings home the true horror of the ARCs. Strong guest stars continue to appear throughout the remainder of series one, such as Graham Crowden as Sondeberg in Decoy and Richard Hurndall as Avery in Voice from the Past. The last two episodes – Witness and Non-Citizen ramp up the conflict between Kyle and the PCD. Dr Vickers, who escaped from the UK in episode two with Kyle’s help, is persuaded to return in order to testify in a show-trial against Kyle – if he does then his family will be granted exit visas. Prior to the trial (featuring John Bennett as the prosecutor) Kyle’s office and home are targeted by PCD thugs, which causes distress to his wife Maggie (Patricia Garwood) and children. Woodward gives a typically powerful performance, especially when Kyle finds his family are under threat. Series one concluded with Non-Citizen. Considering how much of a thorn Kyle has been in the PCD’s side, it’s odd they’ve taken so long to decisively deal with him. But here at last they finally seem to have broken him. With his family missing, no money, no job, no home and no status, Kyle is pushed to the limit by a sadistic Skardon. It’s not surprising that Woodward once again excels here. Although the themes of the first series of 1990 tapped into contemporary fears and neuroses, it’s fascinating how most of it still remains topical some forty years on. The official face presented in 1990 appears to be fair and reasonable – tribunals are held which claim to offer the public an unbiased hearing and the ARC we visit is located in a palatial country home with well-manicured lawns – but scratch a little beneath the surface and it’s plain there’s something very rotten in this state. You don’t need jackbooted guards on every street corner to create a true sense of fear, there are far more subtle ways than that …. The way that language, spin and bureaucracy are all utilised in order to obfuscate the truth is especially instructive. When you hear a politician complaining that the press, in the shape of Kyle, is spreading disinformation and therefore creating disharmony about the state of the economy (i.e. disseminating fake news) then the parallels to the modern world are perfectly clear. In many ways 1990 is something of a chess game with all the major players – especially Kyle and Lomas – engaged in a game of manoeuvre and counter-manoeuvre. 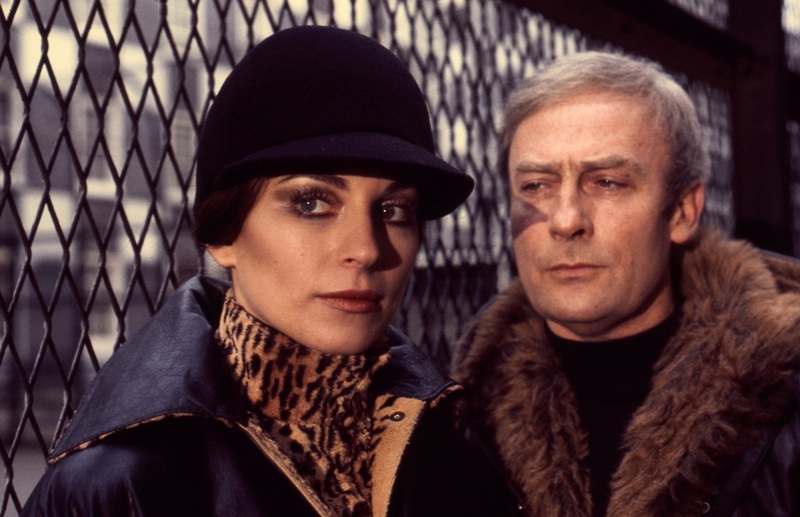 As I’ve said, Edward Woodward is a fine leading man whilst Barbara Kellerman and Robert Lang (who receive second and third billing) offer strong support. The gravelly-voiced Lang graced many a film and television programme with his presence and is perfect as the harassed mandarin Tasker whilst Kellerman (possibly best known for playing the White Witch in the 1980’s BBC production of The Lion, The Witch and The Wardrobe) is intriguing as Della, the apparently acceptable face of the PCD. Kellerman didn’t return for series two, which was a shame, although this did allow the format to be shaken up a little. Interviewed by the Radio Times prior to the broadcast of the first episode, Woodward said that the series was “either going to create a furore or pass without comment” (Radio Times, 17th September 1977). Although it didn’t quite go unnoticed, the fact it was tucked away on BBC2 was probably part of the reason why it never became a mainstream hit. But it clearly impressed enough to be renewed for a second series. Although largely forgotten today, 1990 is a series which deserves to be much better known, especially since its power to disturb and unsettle remains undimmed after forty years. It’s pleasing to have the first series available on DVD, with the second to follow in May, and for those who appreciate well-crafted British character drama of the seventies it’s certain to appeal. 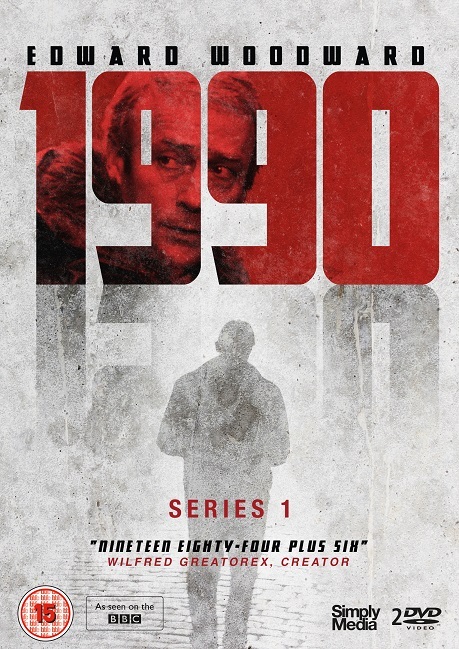 1990 – Series One is released by Simply Media on the 20th of March 2017. RRP £19.99.